City University London is highly commended following DrupalCamp London 2014 which featured stimulating ‘birds of a feather’ (BoF) sessions, code sprints, keynotes and valuable exposure for computer science students. Nearly 700 open-source software enthusiasts met at City University London from 28th February to 2nd March for DrupalCamp London 2014. Impressed by their experience last year, Drupal community members, including established tech businesses, start-ups and City computer science students turned out in strong numbers. 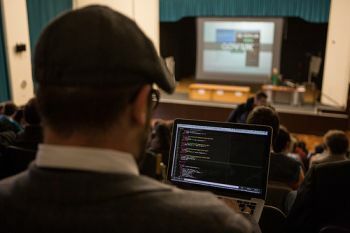 The event featured over 50 presentations on wide-ranging Drupal topics. 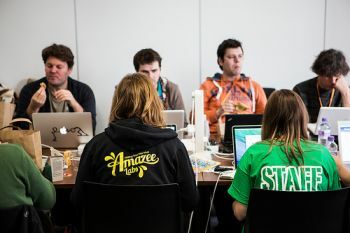 Drupal operates over a million websites for a number of high-profile users including the Cabinet Office, the World Economic Forum, the Grammy Awards, Oxford University and The Economist. "We are very delighted that City was selected for two years running as the venue for such an important gathering of digital experts. Events such as this offer excellent exposure and opportunities for our computer science students. DrupalCamp London 2014 also underscores City's emphasis on an integrated approach to mathematics, computer science and engineering which makes our students highly desirable in the very competitive field of technology". Sessions at DrupalCamp London 2014 included: "How to Release More Code"; "What the ECK! "; "I Want my MTV: Inside the guts of a Global Publishing Platform"; and, "A Gitworkflow for Drupal core development". 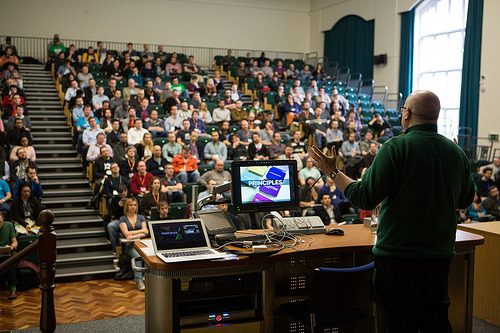 "DrupalCamp London 2014 was an outstanding success. The feedback about City was very positive and the event was bigger than last year, attracting a global audience to our campus for a series of activities which included engrossing code sprints and keynotes. DrupalCamp London 2014 more than achieved the aim of raising the profile of Computer Science at City and among the movers and shakers in Tech City." "DrupalCamp London 2014 would not have been possible without the support of City who kindly made their excellent buildings available to us. The location, based in the heart of the City of London, was perfect for us. In just a section of the University we easily accommodated a little over 300 attendees a day with catering and WiFi facilities provided. City's events and PLU staff demonstrated their usual dedication and generosity. I readily endorse City as a venue for conferences, whether they be technology related or not." Other DrupalCamp London 2014 organisers also included Alex Burrows, Della Deme, Leon Tong, Hedley Smith, Farez Rahman, George Hazlewood and John Kennedy.